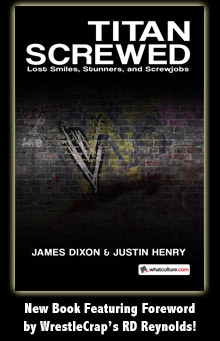 Headlies: One Man Gang Takes on Eight Man Gang, Loses - WrestleCrap - The Very Worst of Pro Wrestling! George Gray, known to wrestling fans world wide as The One Man Gang, is in critical condition tonight at a Chicago hospital following a gangland style beating. Nurse Betty Jones, who spoke with us on the condition of anonymity, told our reporter: “I don’t know what would make One Man, regardless of his size, think he could take on an Eight Man Gang and have it end in any way other than disaster,” she said, pointing to a receptacle bin full of bandage wrappers, medical tape and roughly 3 pints of Mr. Gang’s blood. At press time, One Man Gang was being prepped for emergency surgery that would hopefully stop his internal bleeding and brain swelling, as well as repair several broken bones. 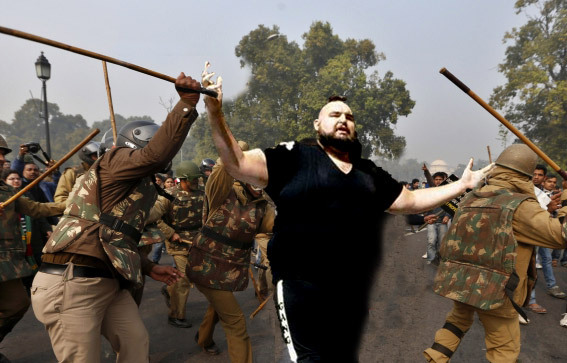 As to the cause of the initial brawl, unconfirmed sources have told WCNewz that the One Man Gang’s biker friends did not take kindly to the victim’s recent identity crisis, particularly when he revealed that – deep down – he felt that maybe he was of a different ethnicity than his skin color would appear to make him. 1 Response to "Headlies: One Man Gang Takes on Eight Man Gang, Loses"
Feel pretty bad for OMG…though I’m sure Akeem wouldn’t have lost that fight. Even the toughest of gangbangers out here in Chicago know better than to mess with a white man from the deepest, darkest parts of the ghetto, I mean…Africa.